Heroes are crucial and have a key effect on the outcome of Battle. How to get Heroes: Heroes can only be acquired by exchanging Shards for them. You can buy Shards from the Credits Mall and the Bazaar. Heroes of different grades require a different number of Shards. Each Hero has a unique Talent and Skill that will be cast when its conditions are fulfilled. Hero Skills: Hero Skills are usually stronger than Creature Skills and can affect the outcome of the Battle. When the Hero’s Rage reaches 100, the Skill will be cast. All Heroes start with a Rage of 50 when the Battle begins Rage increases as your Hero and Creatures attack and are attacked in Battle. Hero Factions: Just like Creatures, Heroes are divided into the four different factions as well. Pair a Hero with a Deck of Creatures from the same faction for a more powerful team. Hero Talents: In battle, Hero Talents can also be activated when conditions are fulfilled. These also have vital effects on the Battle. 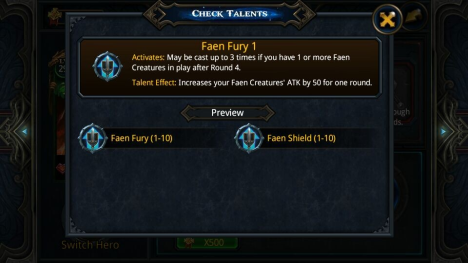 There are many different types of conditions for Talents to activate and they tend to have to do with Creatures of the same faction. Enhancing Hero unlock at the Enhancement Center once you reach Lv 25. 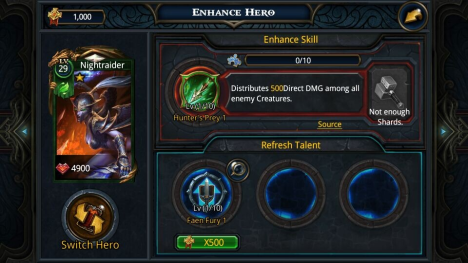 You can enhance your Hero Skills and refresh Hero Talents through enhancement. Enhancing Hero Skills: Hero Skills can be enhanced with similar Hero Shards in the Enhancement Center. Hero Shards used will be removed after the enhancement. 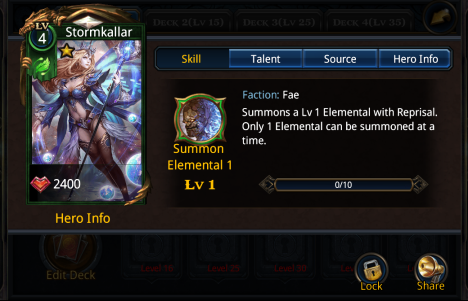 Hero Shards required for Hero Skill enhancement increase at higher Skill levels. Refreshing Hero Talents: Extremely powerful Hero Talents can be obtained by spending Glory earned from Arena and Raids. When refreshing hero talents does the player have a choice which talent it can refresh or is it random? It is totally random which talent you receive. The more talents the hero has, the lower the chance to get a stronger talent. Haha at least not dumb enough to not figure it out. I want ask if your hero have ability for summon any creature where can i find statistics of this creature? Mean atk / hp and description his ability? Also which hero? or would you like to know all? Why arnt u in world chat anymore rosen? Can you get the stats/abilities of Predator's creature if possible? I have enough Gauntlet points to get em but would be good to know if he's worth it before sinking my gauntlet tokens into him. Looking for fun and active players:MATURE!! Hi guys, a little help if you could. I enhanced my heroes talent but the talent went from 4/10 back to 3/10, any idea what's going on there? I also don't get the options when enhancing talent, what's Surrender do and, oh, whatever the one on the left is too. I'll answer you, Eisenhorn. Even though its been months since you asked, it might help others. When you Refresh a Talent, you are, in effect, rolling up a new one. Since there's no real reason to ever want a less effective Talent than you currently have "equipped," you're always rolling to try to get a better, more effective, one. The list of available Talents for your currently chosen Hero, accessed by clicking the round magnifying glass.buttons, is ordered from the least powerful or effective at the top left to the most powerful and effective at the bottom right (at least that appears to me to be the case). I copy these lists by hand for each Hero so that I can refer to them when deciding if I want to keep a Talent I've rolled up (done by hitting the Save button) or let it go and continue on with my current one (by either ignoring it and hitting the Refresh button again, or, if you're done trying to improve that Talent for now--e.g. because you've run out of Glory points--hitting the Surrender button, which takes you out of the Refresh interface and back to the Hero's overview screen. (I agree that "Surrender" is an unhelpful way of characterizing what you're doing if you don't already know; what you're doing is temporarily conceding the "battle" to improve that Talent to the dice roll gods so that, having earned more Glory through your exploits elsewhere, you may return and try again later. The only other thing to know is that most of the Talents have 10 available levels of effectiveness "built in," as it were, while a few have only 1 (e.g. Entrap). Now don't get confused. When talking about a Talent's effectiveness with reference to the magnifying glass listing, we're talking about one Talent's effectiveness versus another Talent's effectiveness. Here we're talking about a Talent of one grade (say, Grade 1) versus that same Talent at a different grade (Grade 10). Thus, when you're rolling for better Talents, you're ideally (usually) wanting to improve both aspects: you want a better Talent, if one is available, and you want that Talent at the highest Grade you can get it at. Here's how improving the Grade works: When you roll for (Refresh) a Talent, both the Talent and its Grade are rolled for, with the Grade having a minimum level equal either to your Hero's current Skill level (his main 10 levelled Skill that you boost using Experience points, not his Talents) orwhatever the Refresh screen says is the current minimum, I cant remember which. Let's go with what the Refresh screen says. If it says your rolls will result in a minimum of Grade 3, then thats exactly what you will get: no grade 1 or 2 Talents. However, while the probability of rolling a high grade Talent drastically decreases as your distance from it increases. Hence, while its not unusual to roll a grade 4 or 5 Talent when at minimum grade 3, it is highly unusual, and maybe impossible, to roll a grade 7. A grade 9 at minimum grade 3 is for all intents and purposes absolutely impossible. Ive rolled lots of talents and I dont recall ever seeing a 7 at minimum grade 3, much less a 9. But I dont know how the code is written, so it may be barely possible, if highly unlikely. But it doesnt matter much, because after a certain number of attempts (never specified) made at a given minimum grade, the minimum will suddenly change to its next "tier," where the tiers are the odd-numbered levels, plus the tenth and final one. So the bottom line is: if youbdont succeed, try, try again. You will always eventually get the highest grade of Talent you're wiling to sacrifice for within a set amount off time/rolls, and absolutely speaking, the same is true of the Talent type (listed in the magnifying glass list). But the type has no "minimum," or any kind of reference that excludes part of the list, so theres no way of knowing how long it might be before you are offered a particular Talent youre hoping for. Here again, the least powerful come up far more often than the most powerful, but beyond that its hard to say. Still, the same advice applies: keep at it. All of them must be possible to roll up in order to be included in the list, so you will get it eventually if youre wiling to pay whatever it ends up costing in Glory. Hope this has helped and not confused you. Ibprobanly should have omitted the bit about probabilities but I thought it might help you to understand how the Hero Talent system overall is intended to work. I creat guild last night, maybe i se my guild is gone today?? ?